« Pizza Pizza Pizza Pizza! when i got into the hideously long express line at Whole Foods in Union Square yesterday, i heard a robotic woman’s voice coming from above, rattling off numbers. 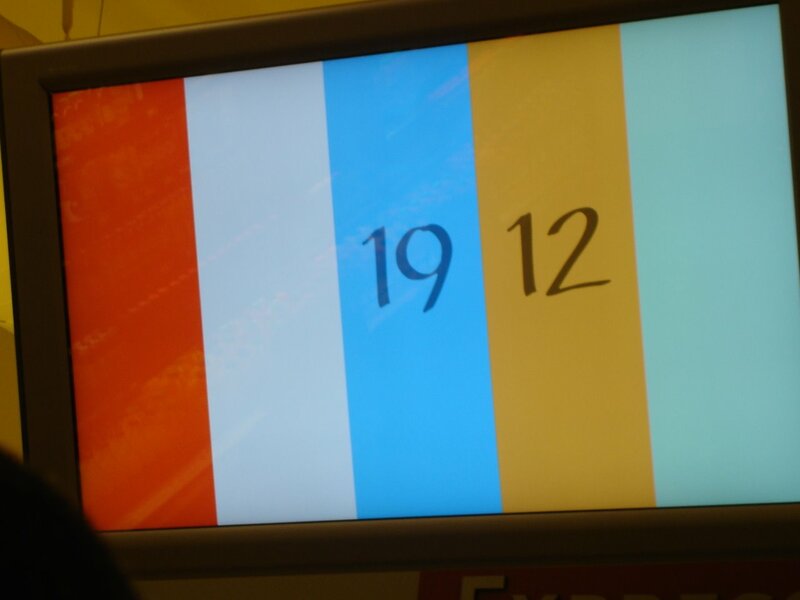 a screen hung overhead, and the voice called out the random numbers “19…12…10…15” while simultaneously, these same numbers dropped down on the screen. i was taken aback by this new system and i had to observe for a few minutes while in line to figure this out– where did that guy go telling everyone which register to go to??? ok, so here is how this works: the lines are divided up, as usual, into express lanes and regular lanes, which both have their individual screens. 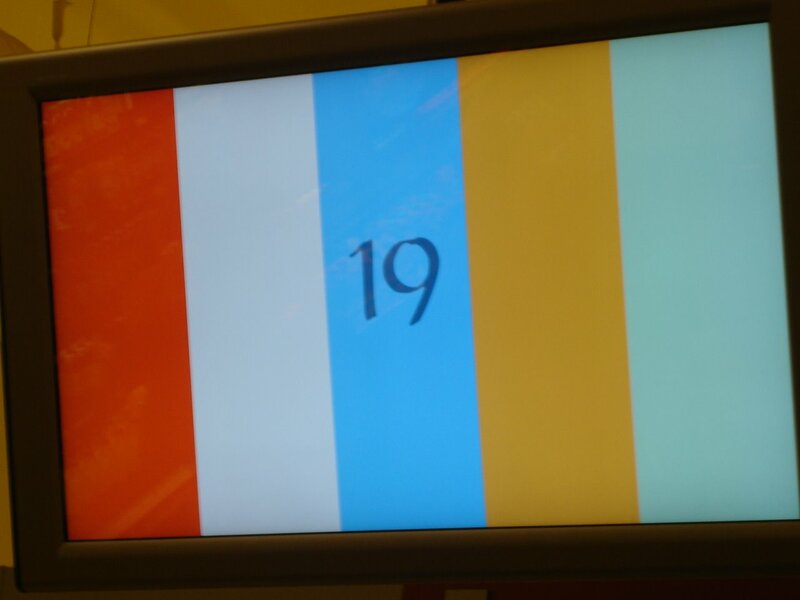 so let’s say that you are in the 3rd lane in– then according to this picture above, your lane “color” is blue and you would go to register #19 when you reach the front of the line. get it? this new system certainly beats the guys standing at the front of the line, yelling at you to go to register #19. this is the most “cutting-edge”, technologically advanced feature introduced to the NYC mass public since they installed train time clocks on the L Train platforms 2 months back (what about the rest of the train lines, MTA???). for such a “cosmopolitan” city, NY is SO technologically behind! footnote: seems like a Whole Foods is in the works for Brooklyn. 3rd and 3rd, so basically Park Slope. awesome. This entry was posted on March 21, 2007 at 6:11 pm and is filed under *Kayoko, design, grocery shopping, tech. You can follow any responses to this entry through the RSS 2.0 feed. You can leave a response, or trackback from your own site. It took me a sec, as I had just come running from Traitor Joe’s, where there was a huge line clogging the aisles with an employee every 6 feet standing with a sign with an arrow trying to keep the snake from deteriorating into a writhing, hungry mess. But was it better? I had a bit of nostalgia — not for the obviously broken excuse for a system at TJs — but for the early days of Whole Foods in NY, when it hadn’t yet morphed into the scrum rush it is verging on now, when New Yorkers had just started to warm to the idea of having all this organic, well-manicured produce with a pumped-in West Coast vibe, when a New Yorker writer found the “facilitator” such a novelty he wrote a short piece profiling his (Mr. Next). Really, I don’t *hate* WF. It’s not perfect by any means. But I’ll take it. The new system seems OK. Makes sense. I figured out the randomly colored bars and lugged my stuff to the cashier, and the woman at the next counter is holding up a bag of mushrooms, asking my cashier, “What are these?” My lady shrugs, has no idea. All I can think of is, not “Shouldn’t you know this?” but “Come on! You’re holding up the line!” Gone is the charming facilitator, Bill Jones. Gone are the days when we had grocers who knew what they were selling. Bill’s been replaced by a multi-colored screen of blinking numbers. This cashier’s job is next.